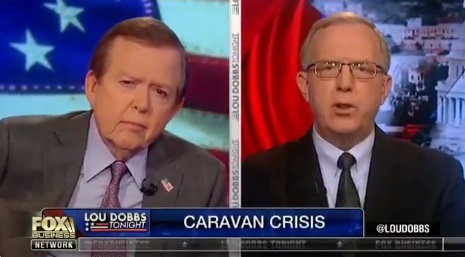 A guest who was scheduled to appear on the Fox Business Network will no longer appear thanks to comments made blaming the migrant caravan on the "Soros-occupied State Department." Gary Schreier, senior vice president of programming for Fox Business, said in a statement, "We condemn the rhetoric by the guest on Lou Dobbs Tonight. This episode was a repeat which has now been pulled from all future airings." "This is a criminal involvement on the part of these leftist mobs. It’s a highly organized, very elaborate sophisticated operation. I have that from the highest levels of the Guatemalan government. A lot of these folks also have affiliates who are getting money from the Soros-occupied State Department, and that is a great, great concern." Soros has been synonymous with conspiracy theories and has recently been accused of funding the migrant caravan GOP Rep. Matt Gaetz (Fla.) also spread that theory days before a pipe bomb was allegedly sent to Soros home. The tweet contained footage of cash being handed out to women and children in the caravan which stirred up controversy. Rep. Matt Gaetz's tweet said, "BREAKING: Footage in Honduras giving cash 2 women & children 2 join the caravan & storm the US border @ election time. Soros? US-backed NGOs? Time to investigate the source!" The Hill reported that Farrell's comments were first aired Thursday night but were later replayed on Fox Saturday which happened to be hours after 11 people lost their lives in the attack on the Pittsburgh Synagogue. Some Twitter users denounced Lou Dobbs over the broadcast featuring Farrell. One user named David Simon wrote, "You know, when the likes of Lou Dobbs takes to broadcast a jeremiad about violent “leftist mobs” on the very day that Jews are mowed down in a synagogue by a right-wight xenophobe — it is, by omission, an anti-Semitic performance, a purposed inversion of victims and victimizers." Michael McFaul also raged on the network for airing the comments alleging Soros backed the migrant caravan. McFaul tweeted, "Soros-occupied State Department"? Hey @SecPompeo, maybe time to weigh in with some facts. In light of recent real attacks on Americans, this obsession with the scary, leftist, "Soros-backed", Middle Eastern invested caravan is grotesque." Nate Silver of FiveThirtyEight even went so far as to say Farrell's comments were "a version of the same conspiracy that the Pittsburgh shooter evidently believed in and which may have helped trigger the murders he committed." The rash of angry tweets seemed motivated by the anti-Semitic messages on social media that the Synagogue shooter posted prior to carrying out the attack. They bend to the left. "a purposed inversion of victims and victimizers." Sound like a it is time for a State Dept audit to either clear the State Dept or start arresting Subversives. Wield that Sword of Truth! Run those traitors out & clear through if need be!